This gingerbread house was created by students at Powell High School. Powell High School students and staff jumped at the chance to aid East Tennessee Children’s Hospital by participating in this year’s Fantasy of Trees. The event runs through Sunday at the Knoxville Convention Center. Tickets are $8 with ages 4-12 admitted for $4 and those 3 and younger admitted free. Hours are 9 to 9 today and Saturday, Nov. 24-25, and noon to 6 p.m. on Sunday. This year, for the first time, students in Angela Pressley’s Nutrition Across the Lifespan class entered gingerbread houses. 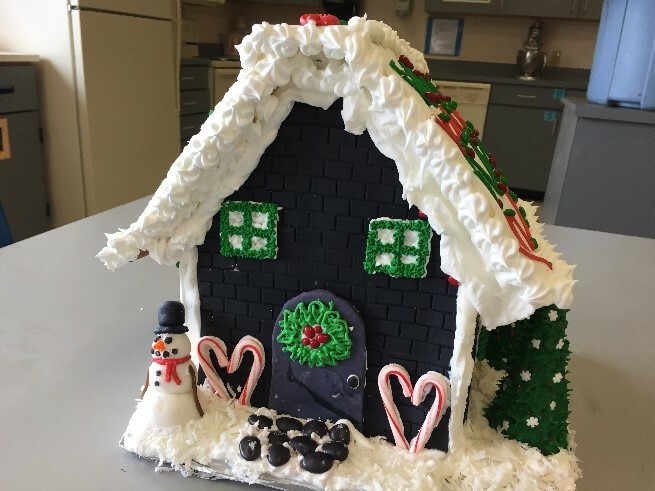 Teams of students designed, built and decorated unique gingerbread houses – using all edible materials. Themes included Santa’s Workshop, a barn and a mountain chalet. The Career and Technical Education (CTE) student organizations got in the Christmas spirit early. Students in each of the clubs created and decorated a three-foot Christmas tree that was later donated to the Fantasy of Trees. FCCLA (Family, Career and Community Leaders of America) created a tree titled “Merry and Bright,” FBLA’s (Future Business Leaders of America) tree was named “Over the River and Through the Woods,” and DECA (an organization of marketing students) created a “Through the Woods” tree. Members in each club designed and made ornaments for their tree. The trees were sold during the Fantasy of Trees.